Our first project tackled the trail up Mt. Stearn, which allows easy access into the alpine areas of Lightning Ridge and the Blackhole region. This historic packtrail ascends Davey Creek and loops over Mt Stearn, descending to the gravel pit on the Sulphur Gates access road. Climbing to the top of Mt. 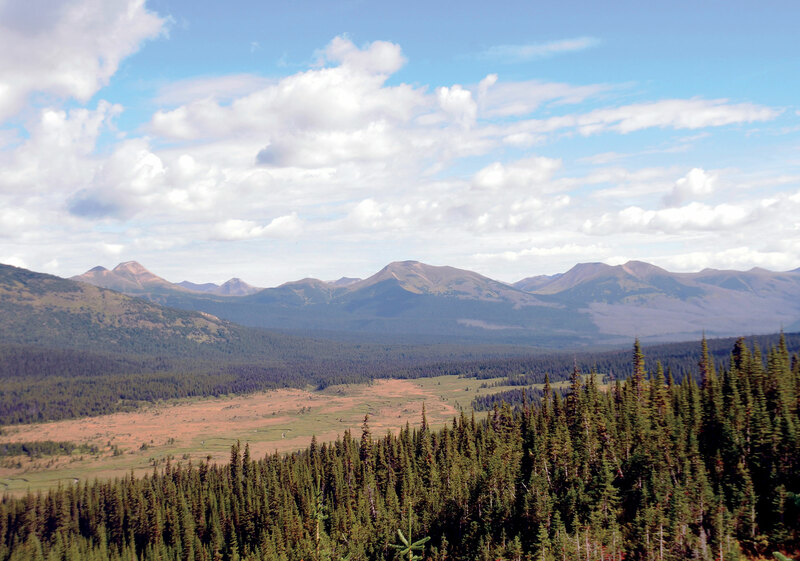 Stearn allows travelers to view the Smoky River Valley, the town of Grande Cache, and Mt. Robson on a clear day. The second trek focused on restoring the trail from the Muddy Water River, up Copenhagen Hill, through the 2002 Smoky River Burn, and over to Boulder Creek. It is a particularly steep ascent up from the Smoky River to the Copenhagen Hill climb; which is an exceptionally vertical scramble, but is mitigated by switchbacks. The Copenhagen route is an alternative way of going up the switchbacks west of the Muddy Water River, to the Jackpine Junction east of Height Creek. The Copenhagen Hill course saves travelers approximately 1 ½-hours enroute to Boulder Creek and the Jackpine River. Our crew consisted of Outfitter Bazil Leonard, Elder Tom Wanyandie, Mark Engstrom, Kelly Warnock, youth mentee Martin Hallock, and cook/cinematographer Susan Feddema-Leonard. There was a lot of heavy clearing through the 2002 burnt out area on the plateau above Copenhagen Hill, as there was plenty of downed charred timber from the winter winds. Second growth pine and spruce are growing back with vengeance, so this section of the trail will need some serious work in 2017. The trail hands took a day off to replace the spirit house at the grave of Louis Delorme’s sister. Ishbel (Hargreaves) Cochrane had previously reported that there was a wooden spirit house on the gravesite when she was there during the 1940s. The elk and weather had destroyed the spirit house, so nothing of the original structure remained. Both Martin Hallock and Tom Wanyandie were related to the girl who was buried on a lovely plateau overlooking the Smoky River. Check out this story later in the Newsletter. 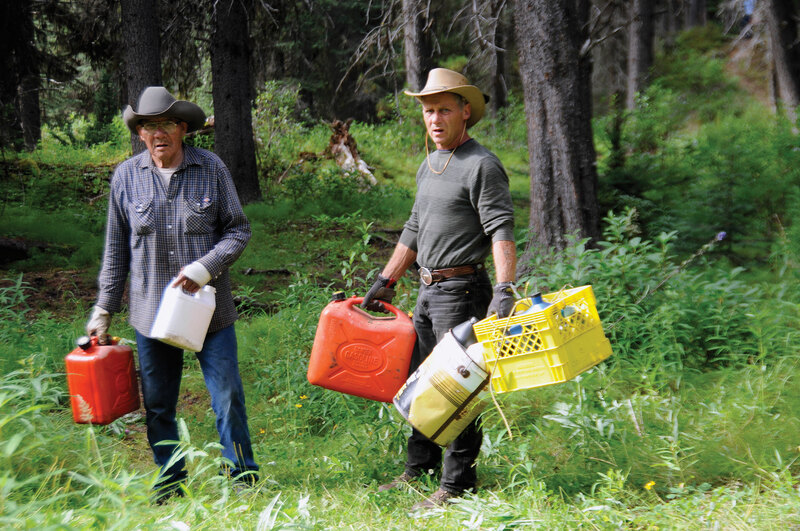 Campground cleanup was done on the lower flats of Kvass Flats, on the historic site near the mighty Smoky River. A big thanks goes to Shane Ramstead and Dan Downy, Alberta Fish & Wildlife Officers for their tremendous support on this clean up. 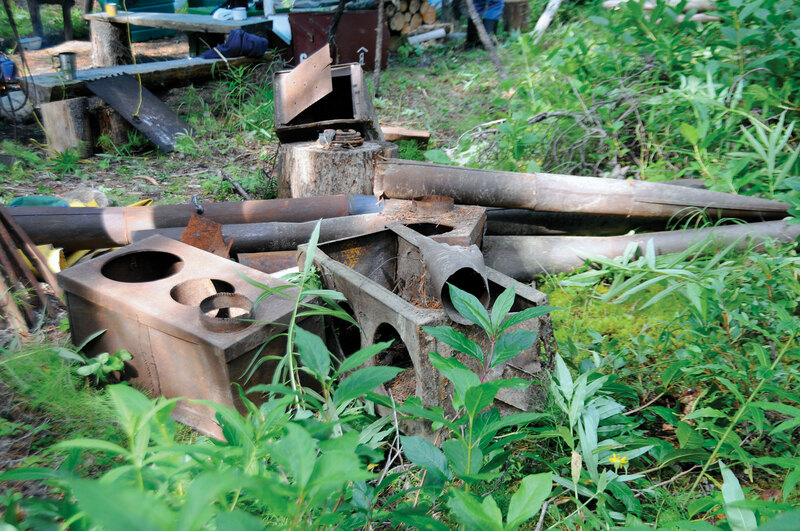 They packed a large quantity of garbage from the site, which has been accumulating over the years. Our trail crew also cleaned up the historic Muddy Water Camp. 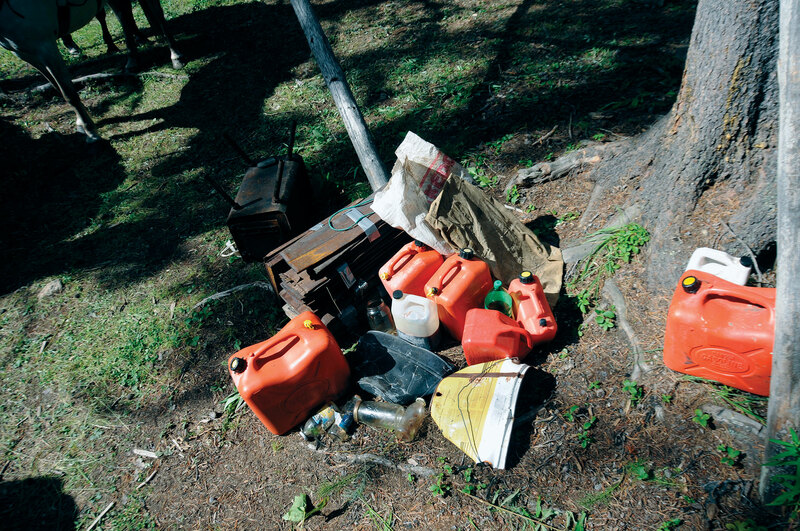 Garbage had been strewn around the site by previous campers. 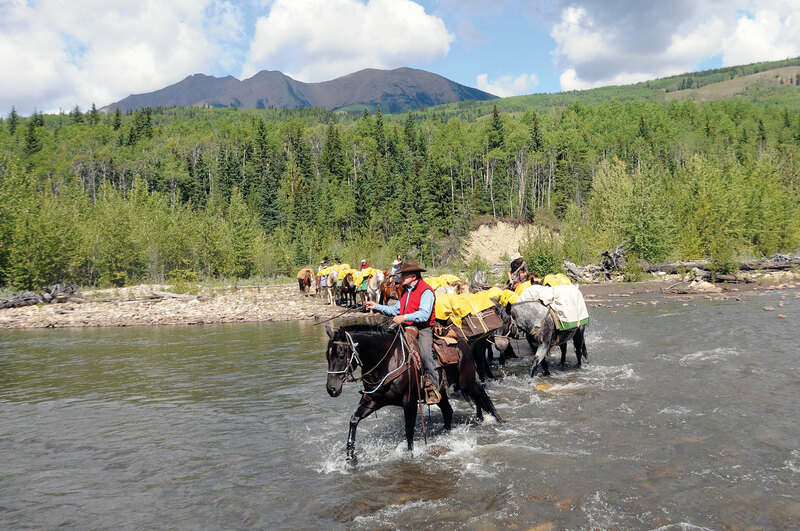 We got off to a rough start on our next trip, as four of our horses crossed the Smoky River, creating a challenge for our trail crew. Gord Leonard and Martin Hallock were successful in getting the horses across the glacial fed waterway using a Zodiac, after many futile attempts. Our trip was delayed even further when Mark Engstrom took 85-year-old Tommy Wanyandie to the Grande Cache Hospital. The old-timer had fallen on a rock as he helped pull a horse across the dangerous river. An x-ray determined that his wrist was fractured, however Tom returned to camp a few hours later with a cast on his arm, ready to head to the Jackpine River camp. There is no holding him down. We made a comfortable camp at Boulder Creek. Bazil, Alison and Gord did a lot of cleanup. They crushed burnt out heater stoves, stove pipes, tin cans, and packed up a variety of bottles and garbage. They burnt off a lot of litter and trash that was strewn around the camp, and organized bundles of junk to pack out on horses during the return trip. We ended up with five packhorse loads from that campsite alone, with two more loads ready for the 2017 expedition. Mark Engstrom headed out while the others were cleaning garbage. 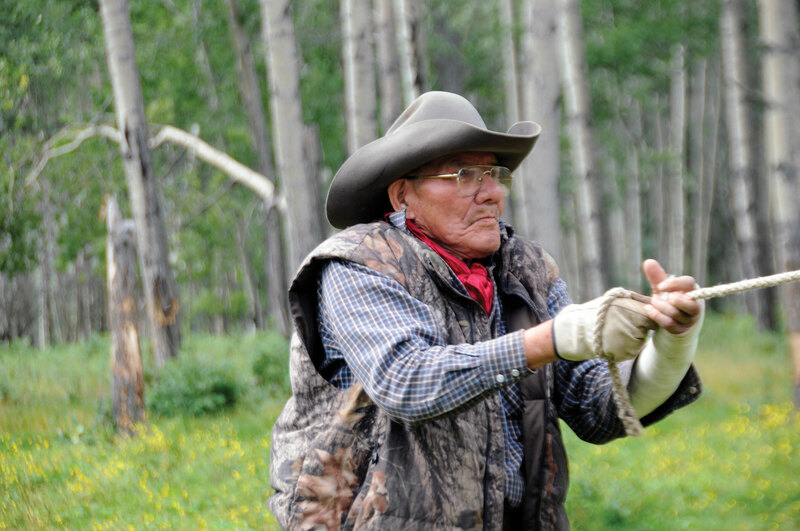 He decided to clean the trail that forks from the Sheep Creek Trail Junction, over to Dave Simpson’s Moose Horn Camp. He cleared and blazed the trail from the Moose Horn Camp and down to Boulder Creek. After three nights we left Boulder Creek Camp and headed over to the Jackpine River. We stopped on our way to erect a Spirit House over a nameless trapper’s grave at Barry Lake. We had also erected a spirit house over an unknown baby’s grave on the Muddy Water River. We settled into the Bazil Creek Camp and decided to break everyone into different trail crews to save time. The first group restored the trail through the 2007 burn to Ptarmigan Lake. Our youngest crew mentee, Payton Hallock, threw logs off for the chainsaw men. 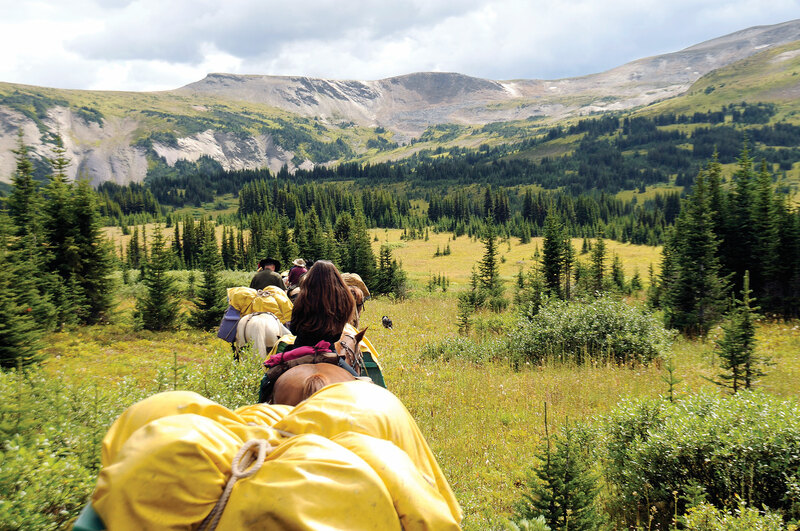 A second trail crew cleared from the confluence of Bazil Creek to the headwaters, which connects to the Continental Divide Trail. A third crew cleared from Bazil Creek back to the avalanche, on the trail to Boulder Creek. There is a steep creek crossing, at the slide area that was extremely dangerous. The trail hands dug out the access to the creek making it safe to traverse, and much more manageable. During the rainy days, our crews packed more bundles of garbage, cleaned the campsite, and split a pile of wood. Benches were built and placed around the fire ring. We returned to Grande Cache by way of Boulder Creek. 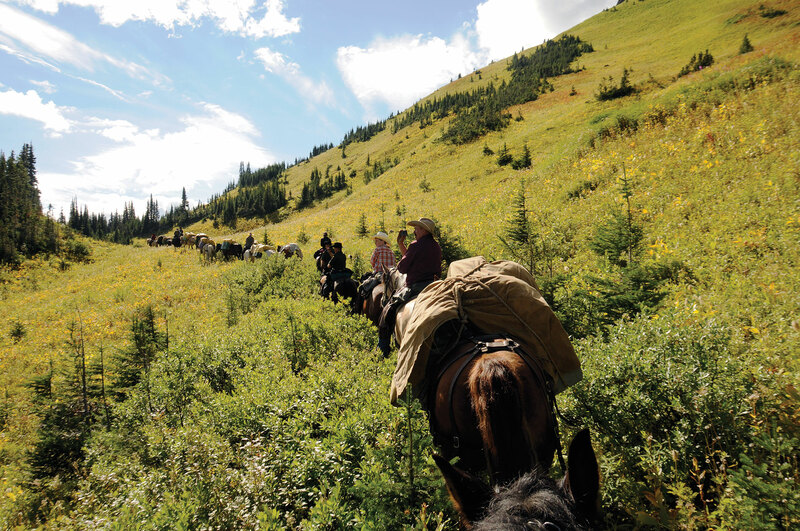 The packstring headed back to Kvass Flats, and home to pay bills and resupply for the Continental Divide Trip. 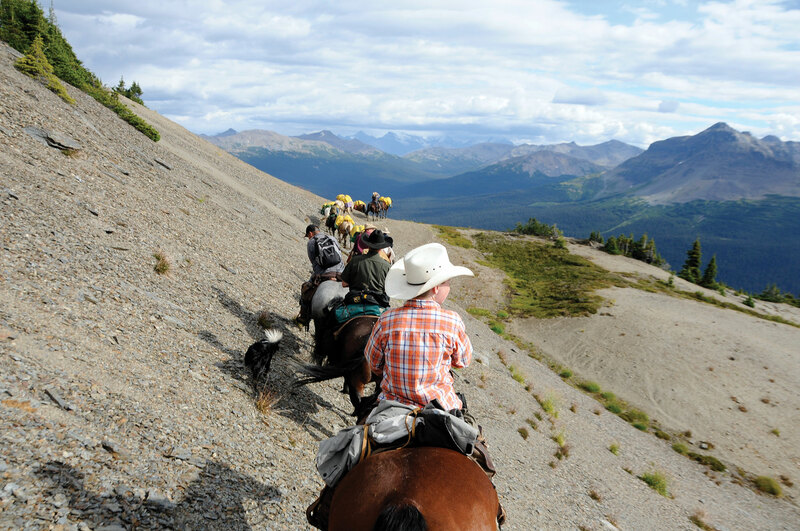 Everyone was looking forward to a fifteen day trip along the Great Divide Trail. 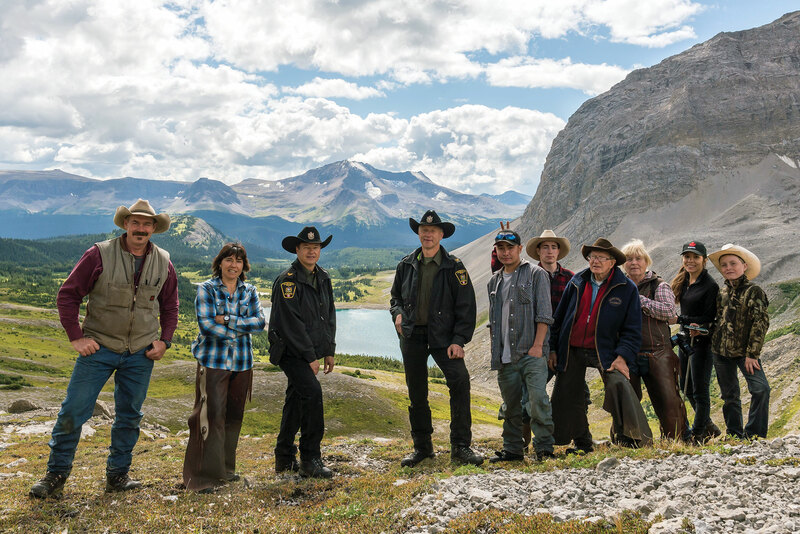 Our crew consisted of Outfitter Bazil Leonard, Susan Feddema-Leonard, Payton Hallock, Mark Engstrom, Ali Klassen, Gord Leonard, Martin Hallock, Chehala Leonard, Fish & Wildlife Officers Shane Ramstead and Mike Ewald, twenty-two head of horses and Rosie, our dog. We spent one night at Kvass Flats and moved immediately to the Sheep Creek Airstrip camp. We made the trip in 8 ½ hours with one repack and a sprinkle of rain, which lasted a short time. The weather was cool, which was great for the move. We had supper in no time, and served smokies, which everyone cooked over an open camp fire, with brown beans, potatoes salad, buns and assorted cookies. Dinner was a hit and the cowboy coffee tasted great. A trail clearing party went out over the next two days and cut through the 2007 Sheep Creek burn, past Cote Creek, to upper Sheep Creek. Some of our crew stayed in camp and cleaned up garbage, which was placed in an Alberta Government shed for a helicopter to pack out at a later date. We were happy we didn’t need to pack this garbage by horse. I awoke to find the mountains clear against the sky with the sun blazing and everything sparkling. I was up about 6:30 a.m. I dried out things in the sun, packed up and took pictures. I cached a copper cover of an old Hudson’s Bay kettle that the Indians used to buy, which Curly picked up last night. I cached it under a log back of our tent, which opened onto the Sheep Creek Trail. We marked the log “HERE CP-J-H 7/18/15” (Curly Phillips-Jobe-Hinman). Shortly after we reached this camp, it started to pour. We were lucky that we had pitched the cook and sleeping tents. We threw up a lash rope and pulled a big blue tarp over the open fireplace, so we were comfortable and dry. We cleaned up garbage, built corrals, a big stone fireplace, and started cutting up the deadfall that was left by the pesky pine beetles. We cut and left ridge poles erected in the trees, and firewood for future campers. 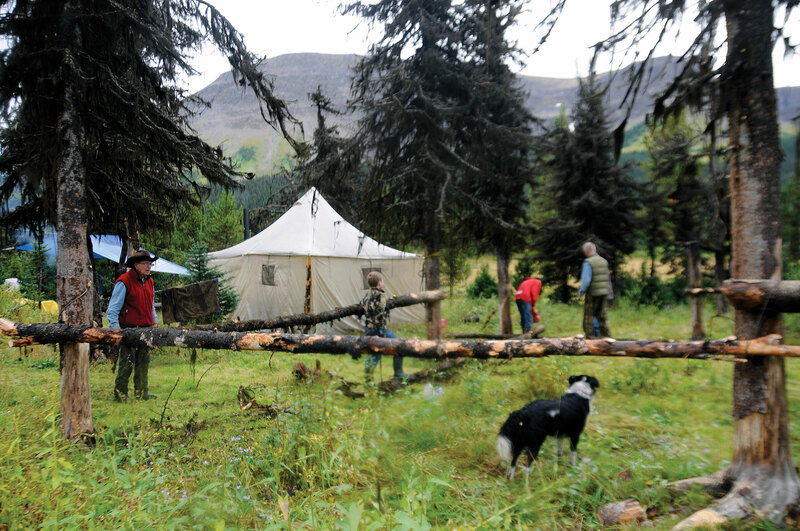 We made the camp comfortable for those who want to explore the Great Divide Trail. The rain lifted and our crew decided to spend a day riding up to Surprise Pass. We didn’t have much time, but did a rough cut of the trail, which hadn’t been properly cleaned in many years. There is certainly more work for us in 2017. We left Copper Kettle camp after three nights. We started moving over the east shoulder of Casket Mountain, however our packstring was halted by deadfall. Our crews completed rough cut through the downed timber to make the trail passable. We travelled past Casket Creek Camp and headed up to Forget-Me-Not Pass. We ascended Featherstonhaugh Pass and over the steep climb to Morkill Pass. We arrived at Morkill Camp at 6:46 pm—7 ½ hours after leaving Copper Kettle Camp. It would have been a 6 ½ hour move if the trail had been clean. Everyone was exhausted, and we were lucky to get the camp set up minutes before a heavy rain, spending two nights in this location. Susan and Chehala made three huckleberry pies, thanks to all the berries that Shane Ramstead and Mike Ewald picked. We even had enough berries for huckleberry pancakes and muffins. Our crew built a big fire ring, and benches for future travellers to enjoy. They cleaned up the area, packing unsightly garbage into the empty pack boxes. We left Morkill Camp at 11:20 am on a sunny morning, and took the junction east to the headwaters of the Muddy Water River. We traversed the soft alpine meadows and descended Bazil Creek to the confluence at the Jackpine River by 5:10 pm. It was a five hour and forty-five minutes ride. This section of the trail needs a lot of work, as the muskegs make the trail hard to see. The soft ground can be dangerous for horses, as they can easily get bogged down. The Foundation’s trail crews will need to find a way to mark the hard to find portion of the trail for future travellers. We spent three nights at the Jackpine Camp and left after breakfast on August 29, 2016. We were packed up and gone from our camp at 9:30 am. We arrived at Kvass Flats 7:15 pm. It was a ten-hour move, including our stop over at Boulder Creek, where we packed up five loads of garbage. Everyone was exhausted from the long move. The ladies served a wonderful supper and hot coffee, which made everyone feel like royalty. The Continental Divide separates the waters that flow into the Atlantic and Artic Oceans from those that flow into the Pacific Ocean, and connects Canada to Mexico through Montana, Idaho, Wyoming, Colorado and New Mexico. The trail network is accessed by both hikers and horseback riders. The Willmore Wilderness Foundation is working at trail restoration initiatives for travellers who want a safe trail to travel on, not only for today, but for future generations. 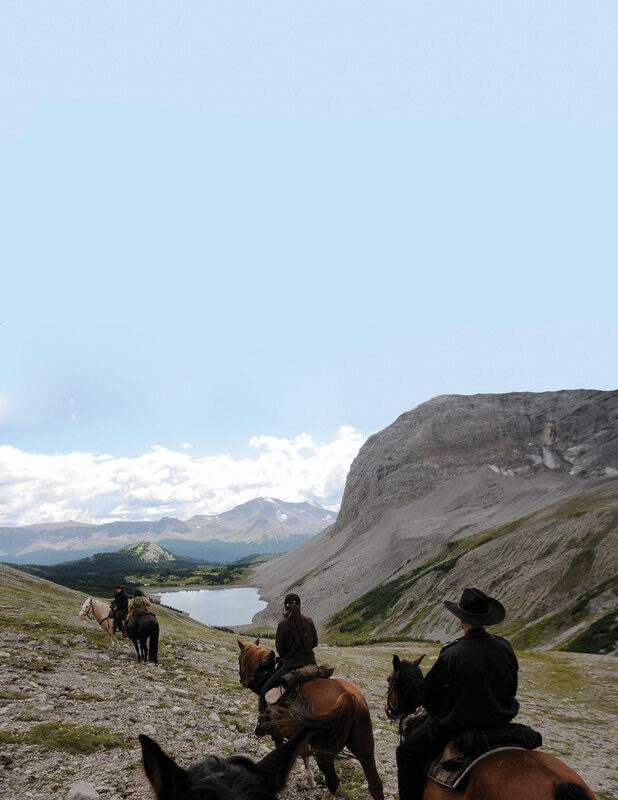 We would like to thank Darryl Joyce of Alberta Municipal Affairs for his support in the restoration of the world famous Continental Divide Trail; a place where history stands still, where travelers can connect with nature, and where horsemen and hikers can still travel freely. All in all, we were able to travel and clear 177 km of Rocky Mountain wilderness trails during the summer of 2016. There is still an unbelievable amount of trails to clear. Susan Feddema-Leonard filmed and photographed the excursions, as well as keeping detailed journals. Our trail crew had a wonderful summer, seeing lots of amazing country. Women of Willmore Wilderness is also a publication and a 45-minute documentary. These stories are shared later in the Newsletter. 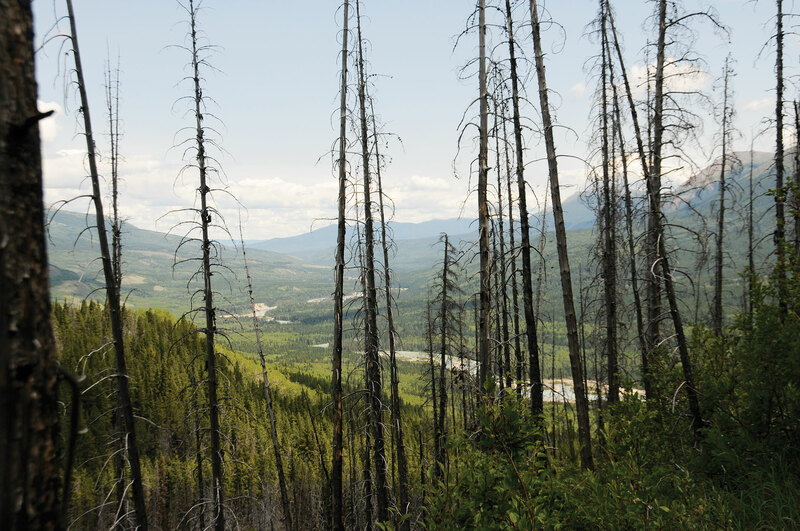 The 2006 Trail Restoration initiatives took trail clearing crews into some beautiful country. 85-year-old Tom Wanyandie packing up for a 16-day trip to the Jackpine River, with a broken wrist. He is wearing a cast here. Looking on the Smoky River from the top of Copenhagen Hill. 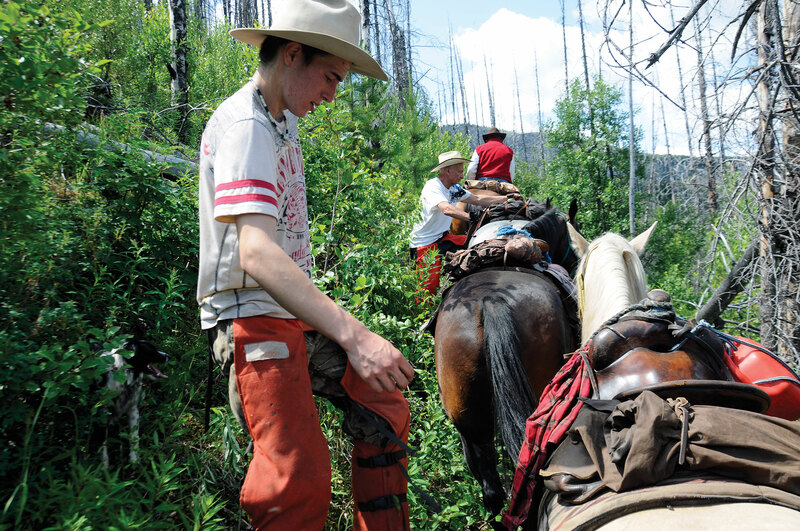 Clearing the Continental Divide Trail took trail crews into high alpine country. Cleaning up garbage at Boulder Creek Camp. 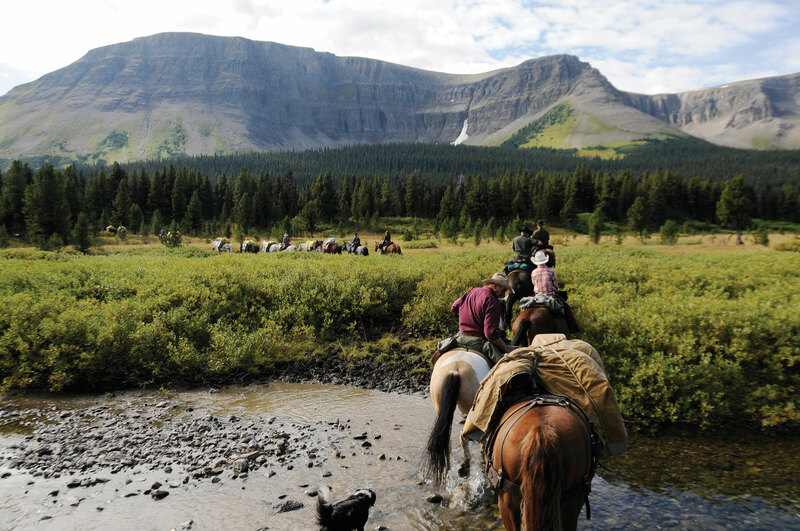 The Willmore Wilderness Foundation cleared through the 2007 Sheep Creek Burn, which took everyone to the trail that travelled over Featherstonehaugh Pass. The Willmore Wilderness Foundation cleaned up seven campsites in 2016. Tom Wanyandie and Gordon Leonard is pictured here cleaning up a campsite. 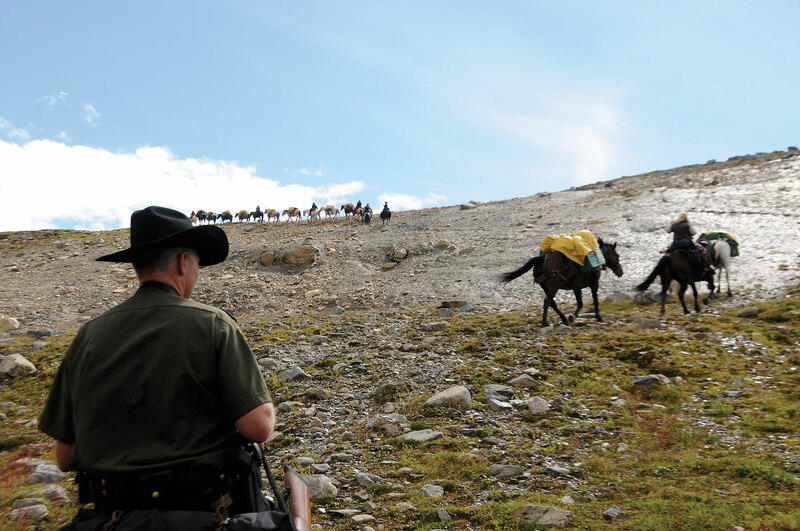 Two Alberta Fish & Wildlife Officers accompanied the expedition. Thanks to the Willmore Wilderness Foundation trail crews who worked hard to cut through the 2007 Sheep Creek Burn, the 2002 Smoky River burn and the 2007 Jackpine River burn. 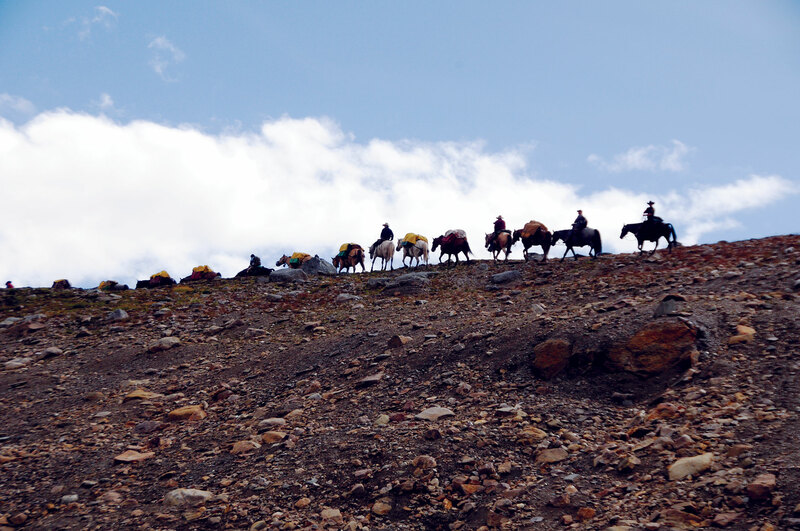 The headwaters of the Muddy Water River and Bazil Creek is soft ground, which need demarcation on future trips, so that travellers can easily find the trail. Hundreds of kilometers were travelled by the trail clearing crew in 2016.